Entry level gaming case with built-in psuThe Thermaltake V200 RGB mid-tower is the ultimate powerhouse for those looking to surpass their setup to a new level. Featuring a SCAN exclusive built-in 550W TT 80 PLUS PSU, stunning tempered glass panel and three pre-installed 120mm 12V RGB intake fans that allow you to control the lighting modes by the RGB button or you can sync with motherboard RGB software including Asus, Gigabyte, MSI, Biostar, and ASRock. With outstanding ventilation and various cooling options, the V200 ensures an efficient performance and more space to expand for additional hardware support. Show off your system in style Display your system and have access to your build with the sleek glass design. The Thermaltake V200 features a full length stunning 4mm thick tempered glass door panel on the left-hand side. This resilient PC case ensures durability and ultimate internal component visibility. 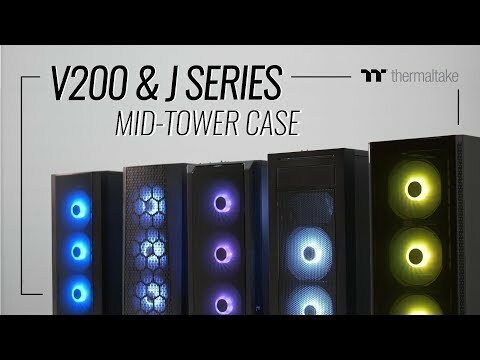 filter through the colours of the rainbow The V200 chassis by Thermaltake, comes preinstalled with three 120mm 12V RGB fans that you simply control using a simple interface, which is built into the I/O panel. Designed to synchronize with the included 12V RGB front fans this allows you to control the lighting modes through your motherboard software. Change your lighting options with a button The easy access I/O Panel cycles through three different lighting modes and a series of vibrant colour modes to make your system shine. Simply long press on the RGB button for 3 seconds, the fans will blink red light twice and the illumination will turn to be controlled by motherboard software, and vice versa. Synchronize your components The V200 RGB is competent in delivering the ultimate RGB lighting customization thanks to the built-in RGB switch board, through the I/O port RGB button or the synchronization with ASUS Aura Sync, GIGABYTE RGB Fusion, MSI Mystic Light Sync, ASRock RGB LED and BIOSTAR Vivid LED DJ - enabled motherboards. Hide away your cables with the PSU coverThe V200 case features a pre-installed 550W 80 PLUS PSU, which is EU certified and highly efficient. Featuring a full length power supply cover that provides plenty of space to tuck away unruly cables, while keeping airflow sufficient for your hard drives and PSU. Outstanding Ventilation The V200 comes equipped with one 120mm exhaust fan and three 12V RGB intake fans, but also has room for two 140/120mm fans in the top. If you prefer a liquid cooled system, you can fit up to a 280mm radiator behind the front panel, which is expertly cooled by intake on the right side. Premium Hardware Support Fit everything you require with the V200, with support for motherboards up to ATX size, tower CPU coolers with a maximum height of 160mm, and VGA length of up to 380mm. The V200 also can fit up to 5 storage devices in its concealed drive bays, which provides you more space for liquid cooling components. Thermaltake V200 RGB Tempered Glass Mid Tower with 550W 80+ PSU, 3x120mm RGB Fans, USB3.0, ATX is rated 4.5 out of 5 by 2. Rated 4 out of 5 by Tevo from Great but not perfect This case is great but it's not perfect. Here is why I think so. I have recently done a system transplant from an old case to this new case and it was great to work with but I have spotted some design flaws. The major one I can think of for the price of the case is no easy HDD mounts. This case is £70 and it doesn't come with these? This is poor, I have seen cheaper cases that utilise these and this one doesn't? The design of the case could easily accommodate this but sadly they didn't use these. Secondly, I think the SSD mounts don't allow enough clearance for the use of 90 degree sata connectors which personally I would think would have been better for cable management through the cutouts, you must use the flat design. Thirdly, The top magnetic dust filter doesn't like having radiators installed with domed screws, Flat designs are fine but if you installing water cooling, expect the filter to not sit flush with the case. Guess this depends on what cooler you are install, thats if you are going to use water cooling. The positives? Plenty of clearance for cable management in the back. Huge motherboard cutout for radiator mount support. Nice clean PSU cover to hide all the cables, if you are into that. The fans are good and silent, No dust filter in the front though... It's well built, the tempered glass makes it look premium with a slight tint. All and all its a good case, but... there are plenty of better options out there. Rated 5 out of 5 by ftw59 from Stonking value! Look, it's not a multi-hundred pound case and PSU, but for what it is, it's exceptional value for money. The case is well built with very few sharp edges. Pleanty of space for cables, although, a few more cable tie-down points would be nice. The PSU is more than adequate for my needs - the cables aren't particularly nice to look at, but let's not lose sight of the price - plus I've got the cables pretty much hidden. The fans and fan controller are a nice touch. They're not the best in the world, but they do the job. Buying the parts seperately would cost significantly more. It's an entry level thermal take 550w The thermaltake Litepower 550w https://www.thermaltake.com/products-model.aspx?id=C_00002408 It's not modular and only the 24 pin cable has a sheath. It's a good PSU that can easily support a GTX1060 and a modest CPU with it's 8 Pin CPU connector. hope this helps.